When life is getting you down or you just want to spend a little time in a beautiful place and have some fun, there’s nowhere better than the beach. Beaches can be found in all shapes and sizes, from mile-long stretches of sandy shoreline with calm, gentle waters perfect for paddling to rocky spots with rough waves for surfers and water sports enthusiasts to enjoy. The United States is home to some of the finest beaches in the world. Down in Florida and along the Gulf Coast, for example, many white, sandy beaches and excellent seafront attractions can be found in locations like Clearwater or Biloxi. Or over on the Pacific Coast in places like Los Angeles and Santa Cruz, even more beautiful beaches can be enjoyed with world class surfing and water sports. However, the best beaches of the United States aren’t merely found in these famous locations. Some wonderful beaches can be found in the northeastern region of the United States too, especially in the New England and Long Island areas. Whether you’re looking for a stretch of sand for sunbathing and swimming or a historic coastal town with beautiful views, the Northeast has some excellent beaches just waiting to be discovered. If you’re visiting the northeastern part of the United States and looking to spend some time down on the coast, there are many different beaches for you to enjoy. Read on to learn about the top beach locations in the northeast, as well as details on the amenities, features, and unique advantages of each beach. Located out on Long Island, Long Beach is so named due to the fact it runs for no less than three miles in total, stretching out along the southern shore of the island. It's a prime spot for New Yorkers, with lots of crowds gathering here on sunny, summer days. In the middle of the week, however, Long Beach can be almost entirely empty. So, no matter whether you're looking for a cozy, intimate setting to spend some quiet time with your loved ones or more of a lively vibe, you can enjoy it at this northeastern beach. You'll find play areas, restrooms, stores, and concessions in the Ocean Beach Park area. Step out onto the golden sands of Boothbay Harbor in Maine and you'll feel like a million miles away from the smoke and grime of the city streets. A wonderful place to kick back and relax, this little coastal New England town has a few different beaches to enjoy, all offering wonderful views and soothing experiences. Lots of great private rental accommodation and hotels can be found in the local area to extend your stay and the waters are always filled with boats of various shapes and sizes, so it can be lovely and even romantic to simply sit or stroll along this northeast beach and watch the world go by. Not far from New Haven and quite easily accessible from local major cities like New York and Boston, Madison is one of Connecticut's truly precious gems. This little coastal town has some of the very best stretches of sand in the entire state. It looks out over the Long Island Sound, with lovely views in every single direction and a lot of nice amenities and high quality restaurants nearby. For now, tourists haven't really heard of this place, so the vibe is quite laid-back and quiet on Madison's beaches most of the time, but we can expect word to start spreading about this little treasure in the not so distant future. Consistently ranked as one of the best beaches not just in the northeast, but in all of the United States of America, Coopers Beach is located on Long Island and features some really silky smooth sands and a lot of fun activities. Live entertainment, including outdoor concerts, can be enjoyed at this beach on a regular basis, and the area is decorated with some incredible upscale residences belonging to the rich and famous. The views are breathtaking, the dunes are a lot of fun to climb, the waters are just right for all kinds of activities, and the local area is replete with useful amenities and good eateries. In short, this Hamptons beach is one of the very best. 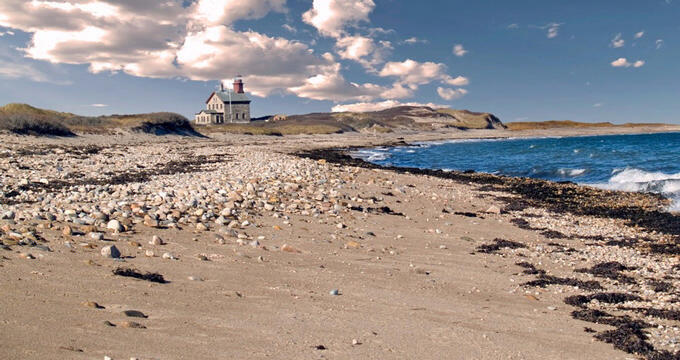 For a New England beach like no other, take the short ferry trip over to the picturesque Block Island. Stretching out to cover around 7,000 acres of land, this gorgeous island is home to some of New England's most wonderful and magical beaches. Only a thousand people live here permanently, so if you come at a non-busy time of year, you'll feel like you basically have the place to yourself, but if you visit in the summer alongside the thousands of other tourists, you'll see Block Island in a whole new light, with a lively vibe and a lot of parties and activities going on at all times. Stick to the southern shore if you want easy access to local stores, eateries, and other amenities.